Kathleen Zimmerman is an assistant professor in the Department of Special Education at the University of Kansas. Kathleen earned her doctoral degree in Special Education from Vanderbilt University. Kathleen is a board certified behavior analyst and holds dual-teaching certifications in elementary general and special education. She is a former public school teacher for elementary students with and at-risk for disabilities in self-contained and inclusive classrooms. 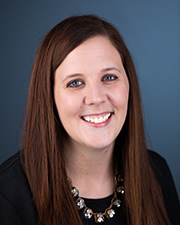 Kathleen's research focuses on the identification of evidence-based instructional practices for students exhibiting problem behavior in general education settings and improving the methodology and synthesis of single case research design studies. Kathleen also engages in partnerships with teachers and paraprofessionals to identify effective coaching strategies to support the implementation of academic and behavioral interventions to improve student engagement in specialized and inclusive settings. Dr. Zimmerman's research interests include the identification and implementation of evidence-based instructional practices for students with and without disabilities exhibiting problem behavior in general education settings, identifying effective coaching strategies to support practitioners implementing interventions to improve student engagement, and improving the methodology and synthesis of single case research design studies. Ledford, J. R., Barton, E. E., Severini, K. E., & Zimmerman, K. N. (2019). A primer on single case designs: Contemporary use, analysis, and synthesis. American Journal on Intellectual and Developmental Disabilities, 124, 35-56. Moeyaert, M. Zimmerman, K. N., & Ledford, J. R. (2018). Synthesis and Meta-Analysis of Single Case Research. In J. R. Ledford & D. L. Gast (Eds. ), Single Case Research Methodology. New York, NY: Routledge. Zimmerman, K. N., Ledford, J. R., Severini, K. E., Pustejovsky, J. E., Barton, E. E., & Lloyd, B. P. (2018). Single-Case Synthesis Tools I: Comparing Tools to Evaluate SCD Quality and Rigor. Research in Developmental Disabilities, 79, 19-32. Zimmerman, K. N., Pustejovsky, J. E., Ledford, J. R., Barton, E. E., Severini, K. E., & Lloyd, B. P. (2018). Single-Case Synthesis Tools II: Comparing Quantitative Outcome Measures. Research in Developmental Disabilities, 79, 65-76. Zimmerman, K. N., & Ledford, J. R. (2017). Beyond ASD: Evidence for the effectiveness of social narratives . Journal of Early Intervention, 39, 199-217.